It is Friday and Karuna is leaving for 2 days for a puja in her home village so I will be here alone. I don’t mind as I have errands to run and some of the younger people I’ve met have asked me to come for lunch and hang out for a bit . It is a nice change of pace and I relish it. I am given a car and first go to finalize the travel arrangements for the trip to Delhi, Agra and Jaipor. Then off to Erica’s flat where she is editing the documentary they’ve been working on for several months about the goat herders here in Kolkata. Her partner/editor is there, a lovely, lively Bengali man and we order in lunch and talk about the business of film making, Bengali art and life here in the city as a “westerner” – Erica is from Italy and we talk about the adjustment to this way of life, and mostly the adjustment we must make when returning to the western world. Since she has been here many times before, she tells me to take note of my thoughts as I arrive at home in the US, how it will seem strange for a while. I decide to keep journaling as this shift will be interesting to document. I am sorry to say goodbye, but I know we will see each other again and we exchange our emails and they go back to editing and I head off to meet yet another friend for a light dinner and some shopping. After a great day, I am feeling very proud of myself for being on my own without relying on guidance or translation from anyone, taking a taxi back to the palace. After saying goodnight to the staff I retire and am just about to get into bed but go off to wash up . Closing the door behind me to the bathroom, I here a click and think nothing of it until I remember that I must have my bottled water for my toothbrush. I try the door and it is locked from the outside. I am locked in! Here I am in my nightshirt and nothing else. No phone of course, and the house is asleep. I bang on the walls but they are thick and the doors are massive and no one can hear me. Now I’m contemplating trying a window or some of the tiny doors but I squeeze through only to find one dead-end after another. Eyeing the length of the claw-footed tub, I am almost resigned to sleeping there but try one more time this time yelling “emergency!” and “aya baba” (OMG). I hear a stirring and then 5 of the staff and the dog arrive to save a damsel in distress. Really. They are laughing hysterically and I am too, out of relief mostly. Never a dull moment with me, I somehow manage to get into trouble even in when brushing my teeth! Today is the big day, the newspaper printed another small article as a reminder – we are hoping for a large turnout. As we finish the final touches having labeled and priced each painting, I go back to the house to dress. Thank goodness for Meera once again, my hands are shaking and I can’t figure how to wrap the beautiful Kantha sari I’ve chosen to wear. from Once wrapped properly, she helps me place a bindi on my forehead and then picks out the jewelry to go with the sari. Antara, Archana and Shamlu give a thumbs up of their approval and we are off to the Palladian. As we arrive I am greeted by my new friend Shalome who is one of the administrators there and he is amazed at my transformation from a racing maniac hanging paintings to a (somewhat) serene woman in Indian dress. 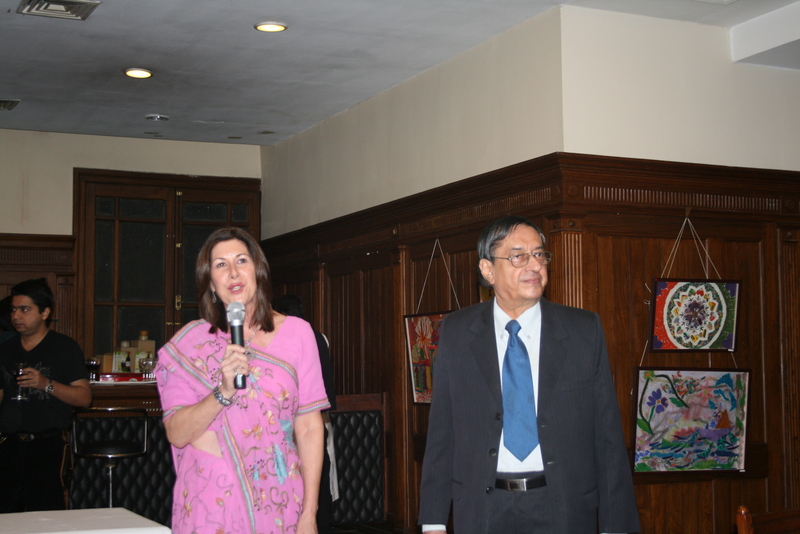 He remarks that I look as though I have worn a sari all my life and I must admit I do feel very comfortable. One last check at all the work, a bit of leveling each collage and we are ready for the troops. The children arrive promptly at 5 PM, and they rush to me hugging, kissing and admiring my outfit. Even the boys tell me that “auntie” looks like a “princess” and I laugh. After they settle down I tell them to look around at all they’ve created and that this exhibit is for them; had they not been such great, talented students we wouldn’t be here having a show. They are bubbling now with anticipation and I can see how proud they are and it makes my heart fill with joy. This is the best time – seeing their expressions. I am so happy for them. We take many pictures and the staff is there to pose with me and the children ask for photos with me as well. Guest are arriving and I must leave the kids to greet everyone, then the media comes, many more than I expected – TV, magazines and 4 newspapers to cover the event. The children’s eyes are a s big as saucers, they are awestruck. The journalists and photographers grab me for shots with the kids, on my own, with the work and then they interview me and a few of the students asking about the meaning of their individual collages and what it was like to work in this medium and with me. Their expressions tell me the whole story and I can’t stop smiling. One fashion magazine pulls me aside to take photos of my outfit and then I’m grabbed by some more of the media. This joint is jumping and I see some of the chief guests arrive, it is time to start the opening ceremony. 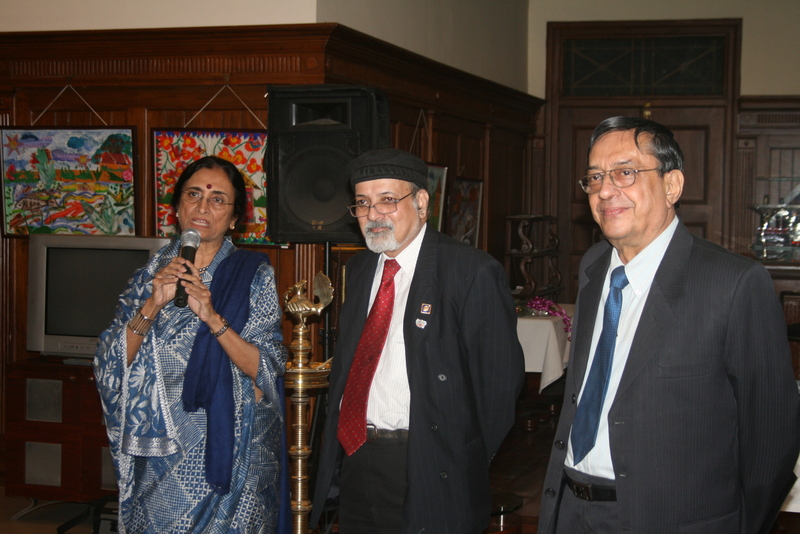 We have speeches and a candle lighting ceremony and Shamlu speaks as do the main guests, one of whom is a very famous artist. 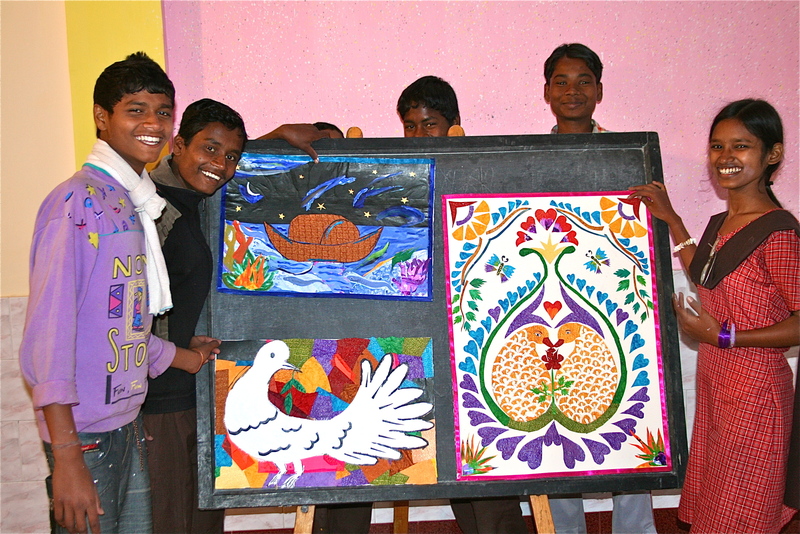 He pronounces the work and the show to be a success and the frenzy begins as the viewers start to purchase the work and ask some of the children to explain the technique and the meaning of their collages. We sell out of the greeting cards Antara has printed and soon about 12 large works are sold. I am asked to say a few words which are mostly directed to the children, had it not been for Udayan I wouldn’t have come to India and not have had the great privilege of working with these children. They have made this experience complete and I thank them for that. I tell them to continue to work in my absence and that a seed has been planted, it must be nurtured by practice and continued creativity. 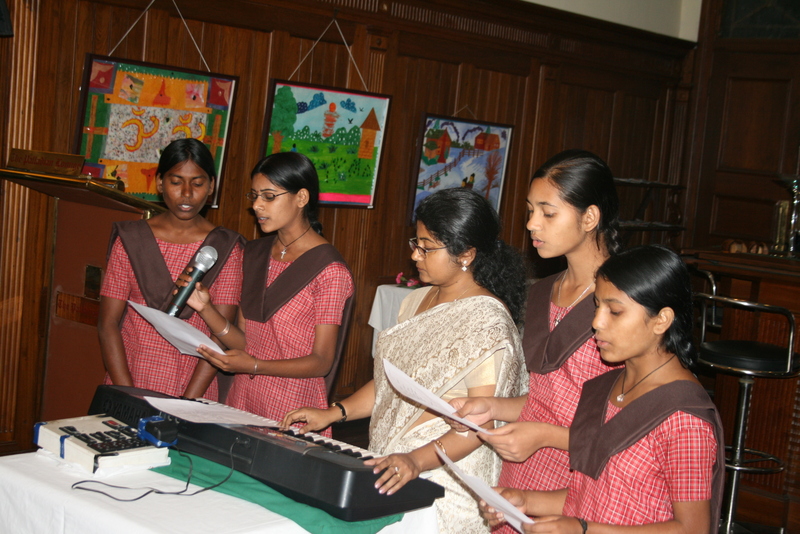 Then Antara and a few of the Udayan girls perform a special song they’ve practiced for the event. 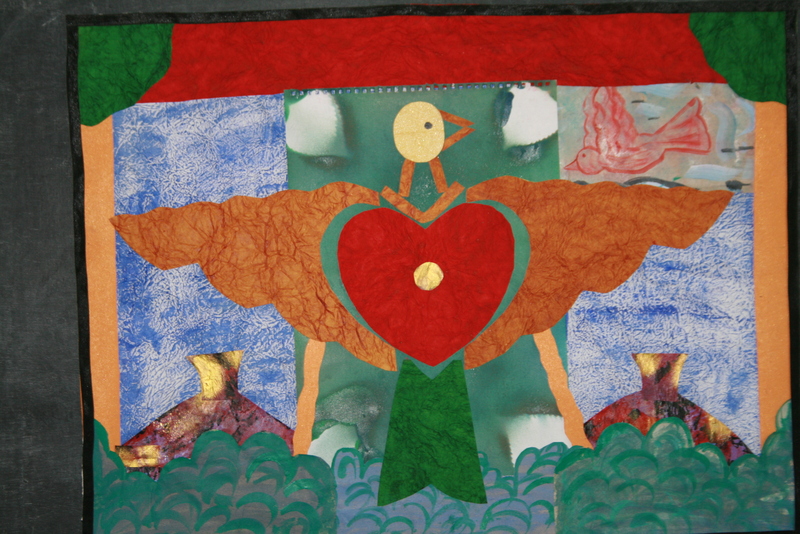 (Antara sings like a songbird and teaches singing with an open heart). Soon it is time for cocktails so the children must leave and we say goodbye tearfully. I promise to come before heading back to the US. The party now is in full swing and when I’m not being interviewed by the press I am meeting with many who are interested in the how and why and also the specific technique I use. So many people, so much interest and love in that room. After it winds down I am finally able to sit and take a breathe. Then Karuna suggests we go for a small dinner and the party continues. We toast to the continued success of the show as it will be on for 3 days, saying our goodnights and head back to our respective homes. Giddy from the success of the exhibit, we all collapse, happy but exhausted. Someone calls to say the TV has aired the art show and interviews, but I don’t know which station so I don’t get a chance to see it. Thursday morning I am called by the editor of Society Magazine for another phone interview and after a very productive conversation she tells me the magazine will be out in March or the very latest April. April will mark the one year since I met Shamlu , very auspicious. I think we make a good team. 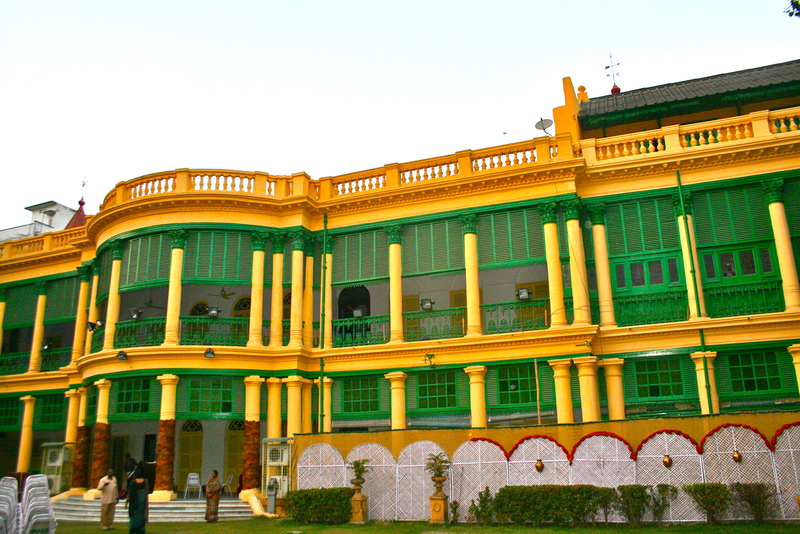 Today I will shift over to Karuna’s as there is a scheduling conflict with a guest from France – I am to stay at a 110+ Maharaja’s summer palace for the next few nights until I head to Delhi. This is a rare treat and the palace is grand. The royalty was “abolished” in 1955 during the fight for independence, though the maharajas were permitted to keep their titles, they had to give up much of their land holdings. In this palace only a small part of this huge, historic building is used for living quarters and the rest is let out for affairs such as weddings. Karuna has invited me to the Oberoi Hotel for yet another fashion show to launch a new energy drink. I am greeted at the door by the organizer of the event and the head of the drink company – we met last night at the art show. Much hugging and kissing occurs and so once again the paparazzi hones in- there are many who were there last night and they recognize me (how could they not – an American in a salwar kameez). We leave after mingling with many of the people I have come to know during this 7 week stint, we exchange cards and some of the more prominent men have promised me that they will do some networking to get funding for me to return next year. 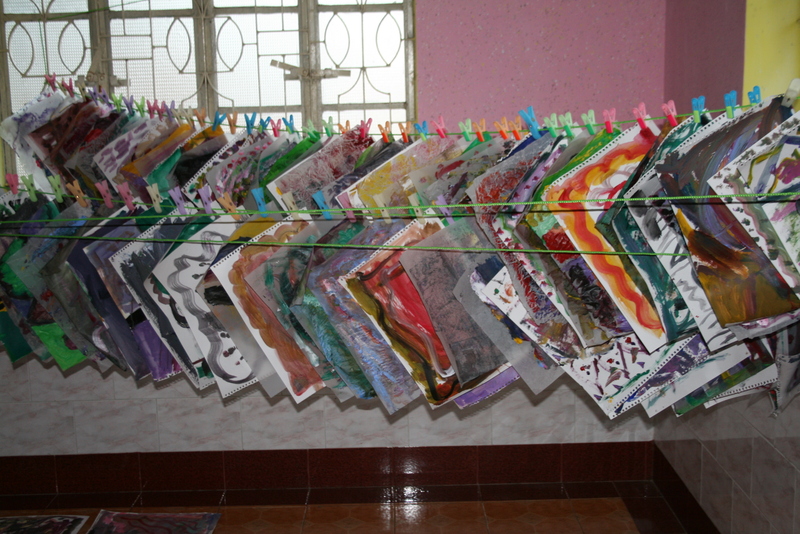 There is no money for art supplies when the children need linens and toothbrushes and other personal hygiene products. Having done my share, we return to the palace and I sleep well having dreams that seem like fairytales. 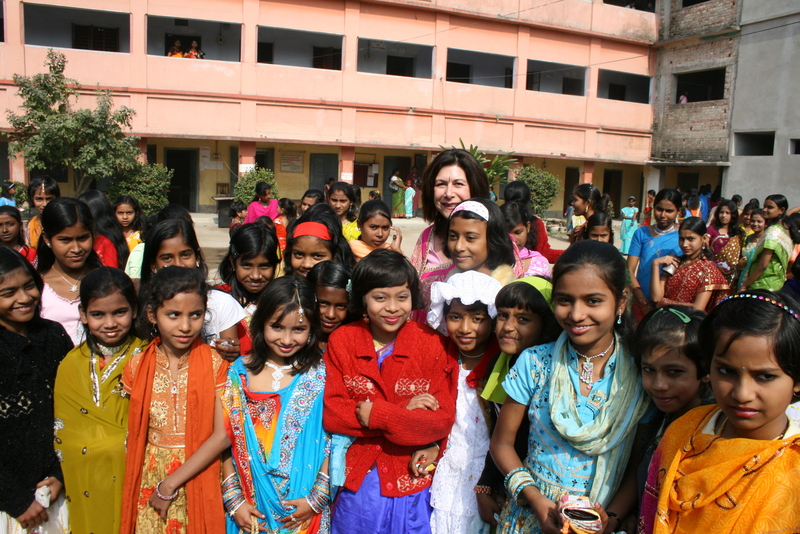 Saraswati Puja, kite flying and a night of dancing under the stars….. I am awake, have my makeup on and am dressed only in my petticoat and blouz, waiting for the girls to come help with the sari. the task seems daunting, I cannot fathom how these young girls and women dress so quickly in this endless ribbon of pattern and amazing color. to me it’s like putting a giant origami on oneself, not an easy task. 7:30 on the dot knock on the door, it is Taniele with all of her things, we are to dress in my room. 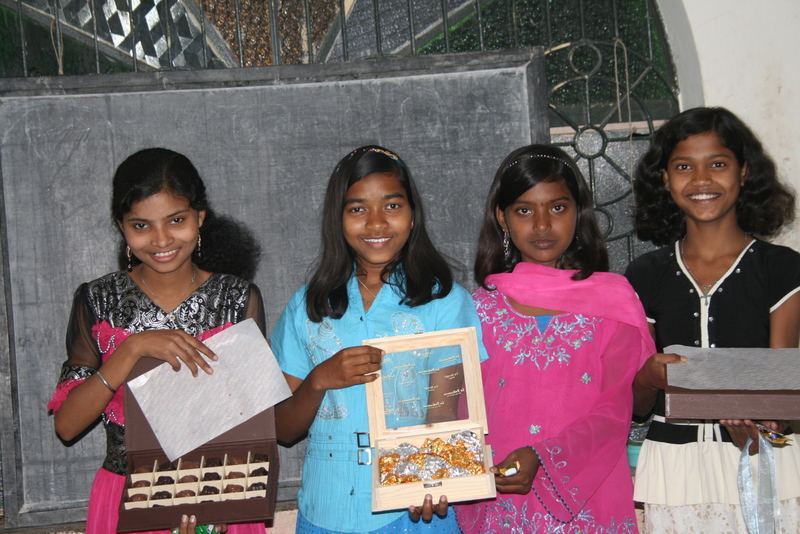 Then another knock, actually several, and we have 21 girls in my tiny room, equipped with jewelry, nail polish, bindi – the decoration worn between the eyes (little paste on jewels), safety pins and extra makeup. The girls are ecstatic and ready to dress us. I feel like a giant Barbie doll, playing dress up with these dorm friends. They stand on my bed, all of them, dressing Taniele and me in tandem. There is some argument as to who is correct in their pleating of the saris, I just hope that whatever happens it doesn’t fall off. the air is full of giddy excitement as we begin to emerge as Indian princesses. The girls are checking me out, insisting I put on more eye makeup and lipstick, very critical of which color I choose. Then the search for jewelry is on, they like my earrings but insist I must wear a necklace and a million bangles. Bothe of us look in the mirror and are shocked to see ourselves outfitted as though we were truly Indian woman. Hair is combed and re combed, pins and sparkles added then removed then an upsweep of the hair and finally down again with a matching pink clip in my hair. Now the room is filled with about 50 girls, and the housemother who comes to make sure we won’t end up unraveling as we walk. She makes a few adjustments and then takes a picture. The girls are now dressed in their colorful saris, and we start a processional to the dining hall to have breakfast before the ceremony begins. The headmasters and the boys do a double take at this parade of beauties. They smile shyly as they see us, the “aunties‘ all dressed up. Everyone is saying “beautiful, beautiful!” in Bengali, we wave and continue towards the alter. A colorful and ornate statue of Saraswati, covered with garlands of marigolds and other flowers has been mounted on an alter of bamboo and sticks, there are plates of food, fruit, incense is burning and clay pots contain more incense to wave as the priest says his prayers. Marigold petals are handed out to each of us, Taniele and I seem to have more than the others. We are ushered ahead to the front so that we may have a great view of the ceremony. Bells are ringing, gongs are banged and we recite the prayer to this goddess of learning. Books have been put into the alter as a symbol of learning and offerings are piled up as well. 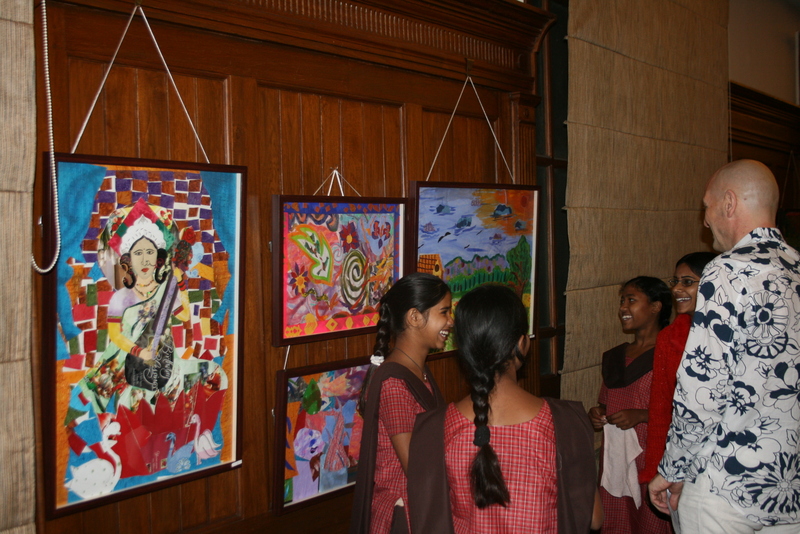 It is gorgeous and colorful, complete with saris of every color of the rainbow and girls looking like beautiful dolls. Father Stevens arrives and the service begins, we recite the blessings and then there is a pause while we all throw the first of three batches of marigolds into the alter. We are covered with flower petals. Taniele is asked to wave the incense around all of our heads, and am given the bell to ring while walking around the alter and children. It is a blessing. 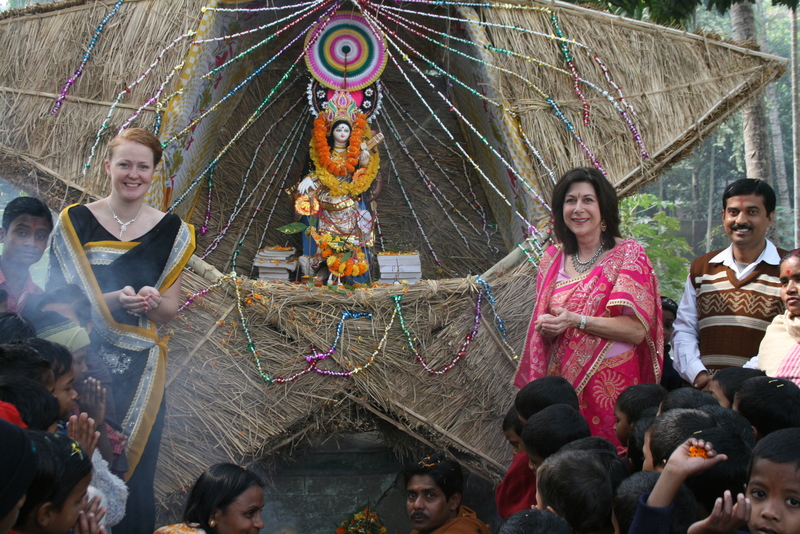 Lastly, we are sprinkled with water from the Ganges River as a blessing for the year of learning. It is a remarkable service and I am taken with the seriousness of these boys and girls. 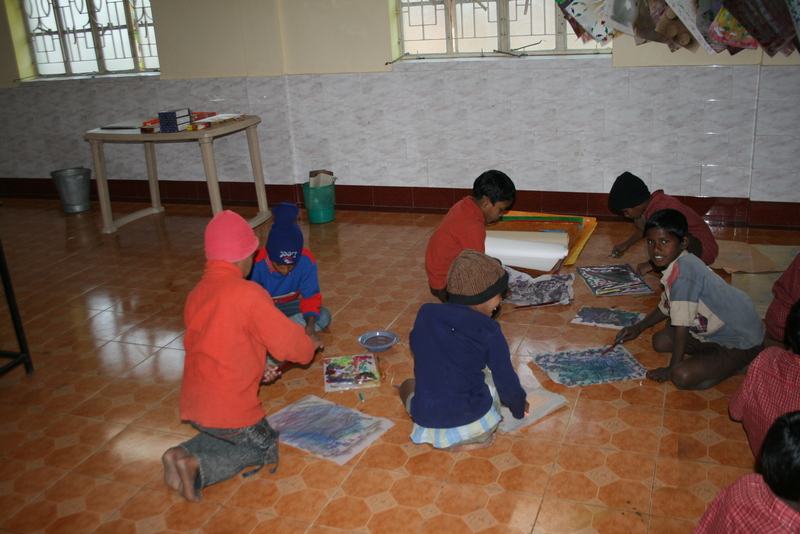 Learning to them is a blessing and they are thankful to God for this opportunity to expand their horizons. Now for the good stuff…Taniele and I are to walk through the village with this pageant of 50 girls to go to each of their schools for a special meal and to show off all of our clothes. As we pass through our local village, the people stare, wave and yell comments about how we look. Men stare as do teenage boys, the girls warn me to not look them in the eye – “they are very rude auntie, very bad”. Even the women of the village look at us with wide eyes, it’s as though we are from another planet, maybe we are. The girls are also very proud of their aunties, dressed beautifully thanks to their expertise. They introduce us to teachers and friends who stare and ask to have their pictures taken with us. We are asked a million questions – where are we from, how many children do I have, everyone is touching the bracelets and my hair and the sari, which is neon magenta and stands out like a huge flower. We have a wonderful meal and soon it is time to leave for the next school. 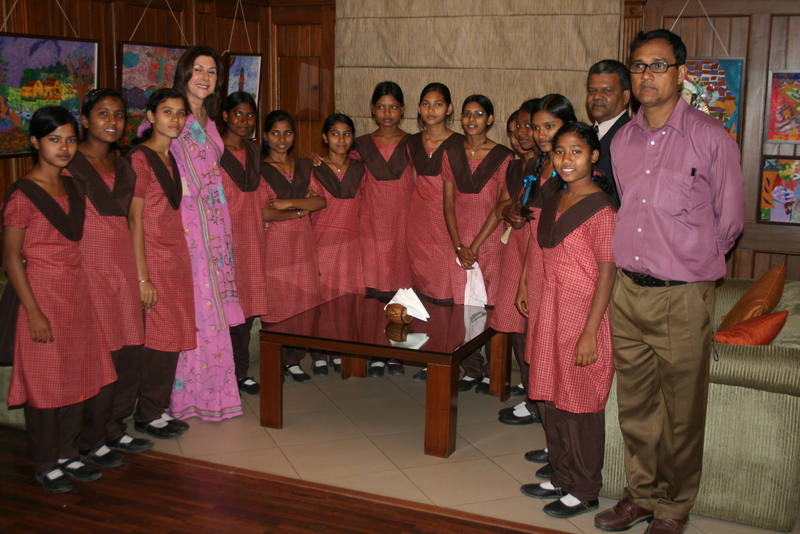 We now we have about 75 girls in our group, friends and others having joined our entourage. As we head for another school (some are Hindi, some Bengali) we run into some of the Udayan boys who join us with their friends. We are 100 strong and I think we must be a site to be seen. The boys’ friends ask if they may take my picture, and of course I say yes, though I am a little embarrassed. 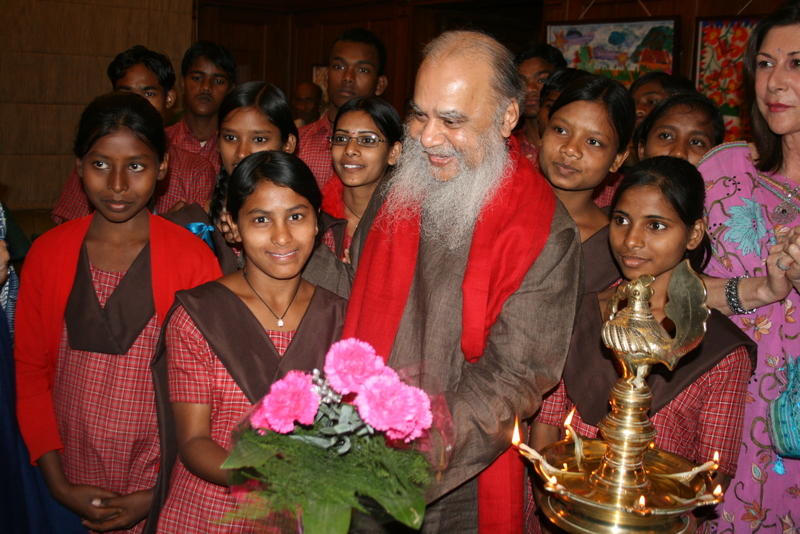 Arriving at the next school we are once again surrounded with young girls, so gorgeous with their hair, jewels and best saris with many of the same greetings and questions. I take pictures and are photographed as well. We are then ushered into another dining hall to meet the teachers and have a meal. I am stuffed but may not say no as it is impolite to refuse food. We eat with our right hand, no utensils are used, we must eat the traditional way which I am learning fast. Once again, goodbyes are said and we go to yet another school, another meal – you get the picture. We have more than 120 students in our conga line at this point and as we pass another school which no one is attending, we are urged to come in and see the facilities, and again asked or forced to sit down to another meal. I look at Taniele and our eyes meet saying silently that we are going to burst! Then, Saddam, one of my art students and a great guy asks us to see his school. we have been walking now for about 5 hours, but everyone says yes, so off we go. ANOTHER MEAL. I don’t know what to say. I’m just grateful that the sari hides many things – like a bulging stomach. We are finally heading back through the winding streets of Barrackpore to Udayan. 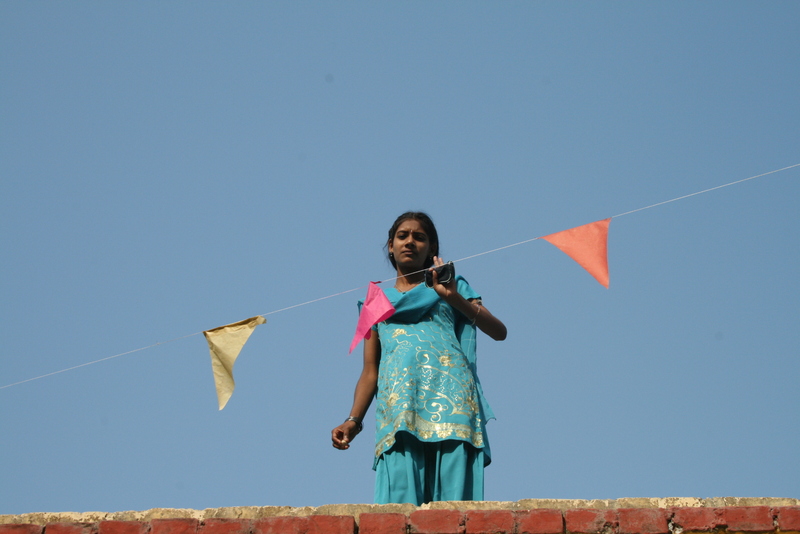 Children with kites are everywhere. I take a picture while walking backwards to just get the enormity of the group across in a photo. Once again we pass at least 50 Saraswati figures and alters and multicolored ribbons hanging from grass alters and huts to worship this goddess. Men are still shouting from the rooftops, at this point I am wilting so I don’t care. I just would like to sit down and wash my feet! As we enter the gates of our school, more children are waiting to see us, and we say good evening then hurry back to the room to undress as quickly as possible. the hell with traditional dress, I put on a pair of jeans and shirt, tie my hair up and feel one hundred pounds lighter. It is dinner time, I have no intention of eating another thing for at least 2 days. The boys have started playing some dance music and are whooping it up , so I stay to watch. Pretty soon I am asked to dance and end up dancing like a maniac, trying to follow the dance steps of these boys who happen to be the best dancers I’ve seen in a while. American boys, watch out! These guys know how to party. I run off to get my computer from the room, I have a movie function and then video tape them as we all dance. 50 minutes later, the battery dies and I’ve got an hour of movies of our dance fest on record. I will edit it and burn a CD to send to them when I return to the States. The stars are out, it is a clear night, everyone is smiling and laughing, I’ve danced with all the boys, even the little 4 year olds, who can dance up a storm. They would be a big hit on “Dancing with the Stars”. I’ve had the time of my life and will never forget this day. Chocolates! Why not, it's a birthday party! I’ve just arrived early this morning, coming back from my sick leave. I’ve brought boxes of special chocolates for each of the four birthday girls, enough for them to share with all the girls in the dormitory. Taneile has gone to the market to buy ingredients for muti, a special mix of puffed rice, chana chur, curry, onions, potatoes, tomatoes, pickles and boiled potatoes. We make the mudi in a giant size cast iron pot there is enough to feed the entire dorm and then some. After making a mess, chopping, peeling and mixing, we are ready for the picnic. All the birthday girls are wearing their finest , gifts from their parents for this special day. We eat and eat, everyone laughing, really enjoying our feast. After finishing and trying to resume order in Taniele’s room, I bring the laptop into the common hall and we dance until we drop! Although there was a bit of a crush to get to the chocolates, Taniele and I tried to mediate as some of the girls were trying for seconds, even though the less aggressive little ones hadn’t received their treat. Finally everyone was satisfied and happy. Taniele and I retreat to the (sort of ) quiet of my room to settle down for a movie and some chips. I feel like I’m back in college again, pigging out and watching TV while chatting away about each of our lives. Once again I am grateful for this friendship. 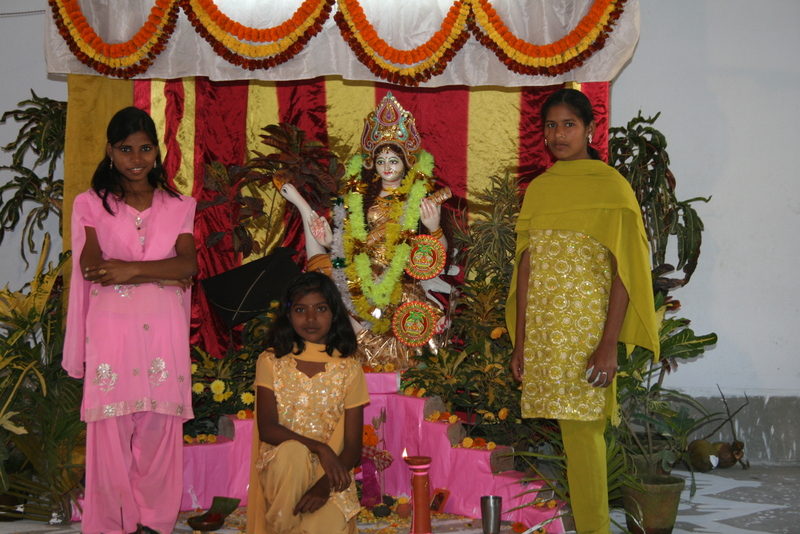 We call it a day as tomorrow we must be up very early to dress in our saris for Saraswati Puja. We have our “dressers” arriving at 7 AM to ensure we are properly attired. 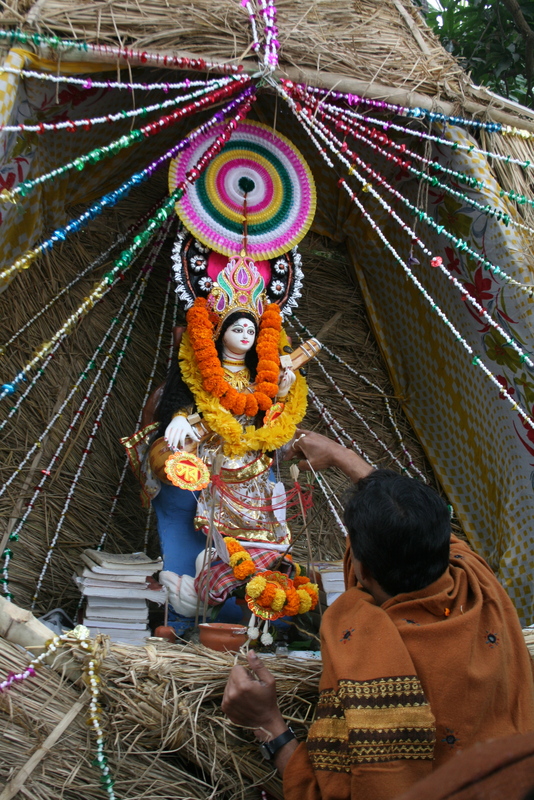 I sleep soundly and wake with anticipation about the pomp and circumstance of this puja. I feel like a kid again. These children have a way of erasing all time, I am rejuvenated. Just give them your time and some paint...magic! It is Saturday and I am pressed for time. I need to get enough collages finished so they can be framed. I lost a day yesterday as I fell ill and couldn’t get out of bed. Still sick, I went to the art room to teach anyway. Would rather feel miserable but working with the kids than feel miserable in my tiny room. We started at 8 AM with 11 of some of the most talented students who have demonstrated an understanding of my technique as well as passion for the work. The room was silent, everyone was in the “zone’ and I put on some Hindi music to keep the pace going. 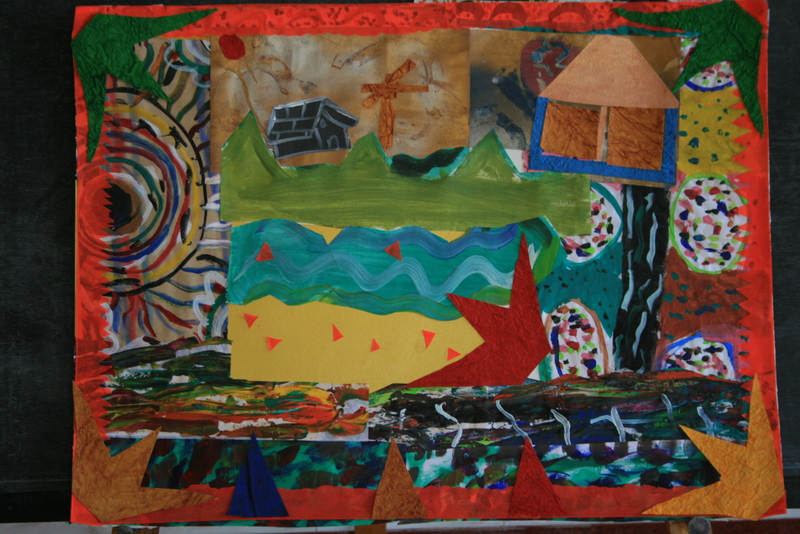 Within 3 hours, 4 of my students had completed an entire collage! 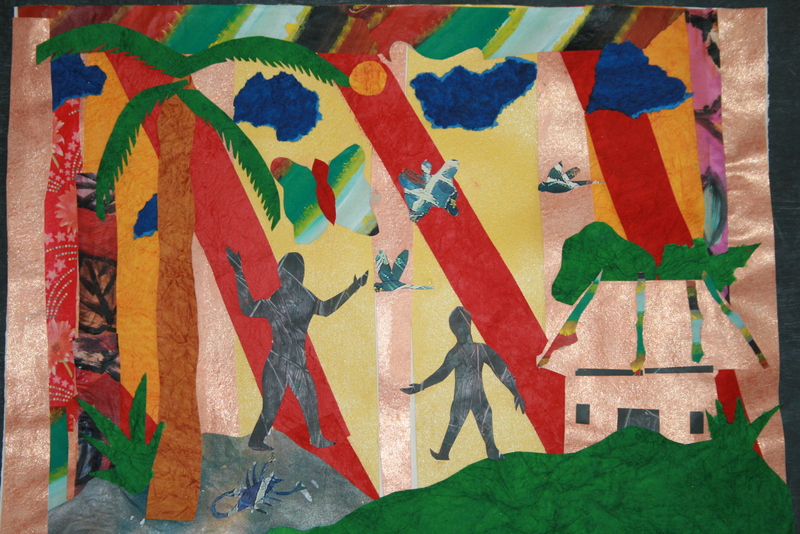 Not once did they ask for help, as I had been concentrating on making rounds to the ones who needed a little push, some guidance, I was shocked when they called me over to show me the completed collages. As awful as I felt physically, I was euphoric ! Lunch came ad went, no one wanted to leave the art room, so we continue to pull a painting marathon. It wasn’t until the light has gone that we realized we had worked all day without a break, and that we were almost missing dinner. These students stayed to spotlessly clean the room, and we all left together, our passion solidifying our friendship. I felt complete. There is quite a bit of untapped genius here – these children would be in elite art schools if they were from any other place in the world. I am determined to keep pushing them, hoping that when I return next year many will have graduated and possibly be on there way to schools for the arts. Since the start of the school Olympics, there were cricket matches each day and today was no exception. As I exited the art studio the match was still on – these passionate students, so sensitive and quiet while working in my art room were intense as cricket players, so serious and competitive. Taniele and I laughed as we both remarked that we could be at any school in America or Australia or anywhere, and the students would not be different; just boys in a major competition, fiercely playing and cheering their favorite teams on. 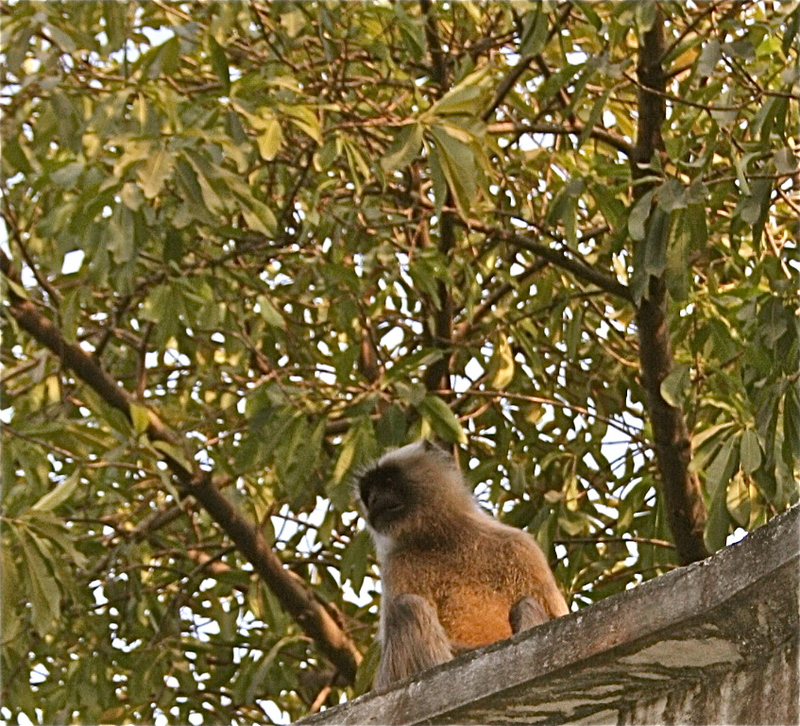 On my way to my room to pack up for Kolkata – I was going there to rest, see a doctor and take a break, I was urgently called by Taniele and several girls shouting “auntie, monkey on the roof”! I had no idea what they were talking about, I knew there were jackals, foxes and dogs, but not monkeys hanging out at the school. I grabbed the camera, flew over to the playing field only to find hundreds of the little ones squealing with delight as they watched a bora hanaman (very large monkey) sitting on the roof, eating a banana, unfazed by the commotion below. 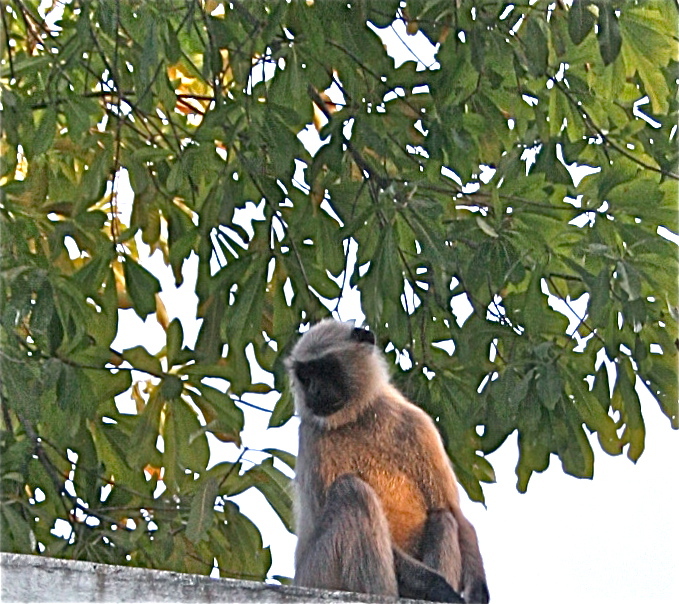 He eventually moved to the rooftop overlooking the cricket match and seemed to be watching the game. As the children persisted to yell at him and laugh, he moved about (I think trying to escape) these “crazy creatures” below- it was to no avail, everywhere he went the children followed. Finally getting annoyed, he took the flowerpots which lined the roof and started hurling them at the children below. With my camera in tow, I tried to shoot a few pictures, only to be abruptly stopped – he hurled one at me, missing me by a few inches. Guess he didn’t like paparazzi – I decided to take refuge and pack my things to leave for Kolkata. "Hmm.. ready, aim, throw the flowerpots!" I arrived at the Taj Bengal where I was to stay as Shamlu had other house guests in my room. It was a great move as the manager recognized how sick I was -I had no voice at this point. He alerted the staff to my demise, and everywhere I went someone was standing there with a hot cup of spices, ginger and lemon to drink. They stayed to watch me drink the last drop. About every 20 minutes the door would buzz and more tea, hot “toddies” (non alcoholic) and salt to gargle with would arrive. Flowers came as well, with a note telling me to arrange for a eucalyptus steam, sauna, and aryuvedic massage. I arranged this for Sunday, and not feeling much better forced myself to make the appointments. I was glad I did. After a few hours of this pampering, my throat started to feel better, and I felt almost human again. Treating myself to a meal at one of the many restaurants at this hotel, I stuffed myself with salad, fruit and PIZZA! It rivaled any great pizza in New York. Even though I was under the weather I knew I could get very used to this. The shower was the best ever, and the pillow too – small things we take for granted were a delight . I savored every minute. By Monday morning, the Maitre D knew me well and ordered all the hot drinks for breakfast and insisted I eat an omelette (he didn’t have to force me) and porridge. Water and juice were served at room temperature so as not to hurt my throat. That afternoon, a friend from Kolkata paid a visit to see how I was feeling and he too insisted on feeding me. I was stuffed but still a little sick. The hotel and my friend called the hotel doctor who paid a “room call” complete with blood work and prescriptions which were filled without delay by the staff. Rick ( my doctor husband) had sent me with a small arsenal of medicines and had started me over the phone with the correct antibiotic. By Tuesday I felt well enough to return to Udayan. I loaded up on chocolates for the girls in the dorm – it was the birthday of four of them and there was to be a celebration. I also loaded up on oranges, bread and olives, having had my share of rice, rice and rice at the school. The ride back was early in the morning, so early that I was treated to a remarkable site – goat herders walking their flock in the middle of the main roads in Kolkata-unbelievable! Here, in this city of great buildings, shops, shacks and hustle and bustle, vying for a piece of the road crammed with all the vehicles and animals and every conceivable being and object was this man, oblivious to the noise and commotion, as his goats walked peacefully to their home, having grazed for the day. What a country of contrasts. Networking, meetings and more paint! I have spent the weekend at Shamlu’s home, going from one party to another, it’s a whirlwind of socializing and networking. I admit it is fun dressing up in Shamlu’s gorgeous saris. I shop the next day for supplies and a few new kameez. Returning “home”, we then meet with the Consulate General from the United States to discuss the possibility of funding the exhibition. 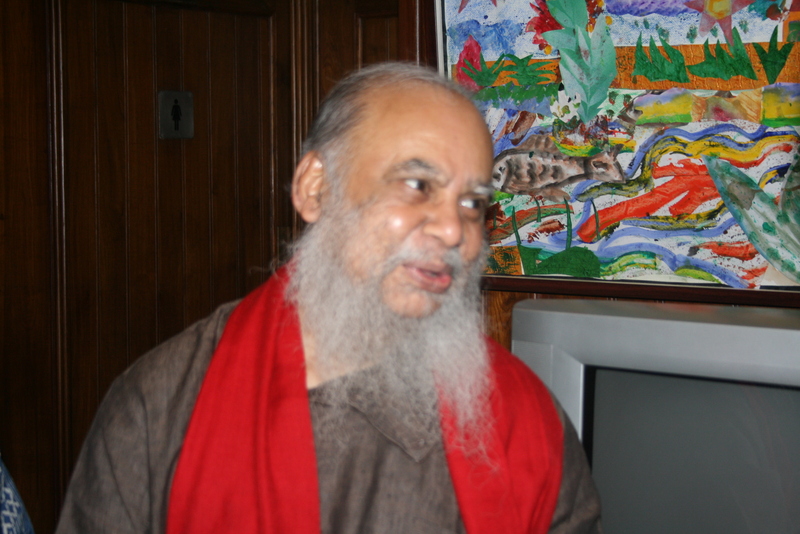 Then I am off to another party – people I have met the night before, and on Sunday, a brunch meeting with a new friend and then, the grand finale of the weekend, an intimate meeting with HH the Dali Lama. I am brave enough to ask a question which he immediately answers. I am in Heaven! It is finally time to get ready for my return to Udayan. Where has the time gone? After this, we are over to the Palladian Lounge for a meeting about the exhibition, The Lounge is our venue. It is large and very beautiful. Invitations, publicity, framing, hanging and timing are discussed and arranged. There will be a press conference at the school, photographers will shoot and film the work in progress. This is a big job! I thought I would peacefully paint and teach the children but there is so much interest and so much need for funding – it has to be a spectacular event. Then, I am whisked off to collect more painting supplies as the children’s enthusiasm had depleted my stash of paints and paper. We are getting creative, using plastic plates as palettes, plastic bowls (25 rupees each) for water. Loading the car with the supplies, my clothes and chocolates for the children (400 pieces) I am on my way to Udayan. This taxi driver is OK, but it is still an insane drive. I cannot watch any longer or I will commandeer the car and drive myself. Swerving on a 10 foot wide 2 way road, trying to avoid the trucks, buses, people, bikes, motorcycles (these guys are nuts) taxis, private cars, rickshaws, cows and occasional dog, I decide to take out the computer and write. At least I’ll have some productive time before we crash. As the taxi drives through the gates, the children are waiting, shouting Auntie, auntie, good evening Auntie. I am home. The boys take all the packages from me, and I unload while chatting with my very good friend, Taneil. We are compatriots, holding down the fort for the girls. We are interrupted by the girls who have major English exams tomorrow – they want us to tutor them. 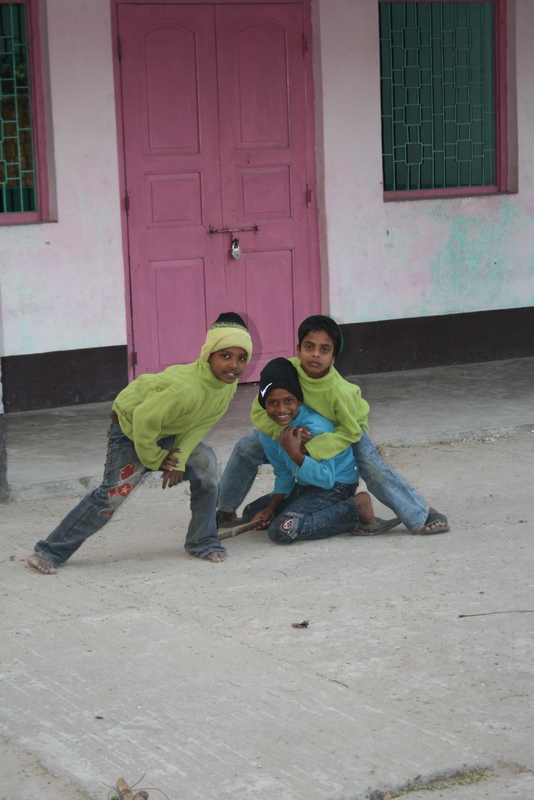 They speak Hindi and Bengali. I shrug and try to explain, action verbs, “being” verbs as they call it, present and past tense of each of the above. All while miming and pointing to the Hindi and Bengali translation of the English I am teaching. Taneil and I are wiped out after they leave. We settle down, looking through all the new salwar kameez outfits I have bought to work in and then watch 30 rock. Fun! Some little friends waiting for me. I crash and awakened to silence instead of the usual chaos of the morning. I have overslept, having somehow turned off the alarm in the middle of the night!